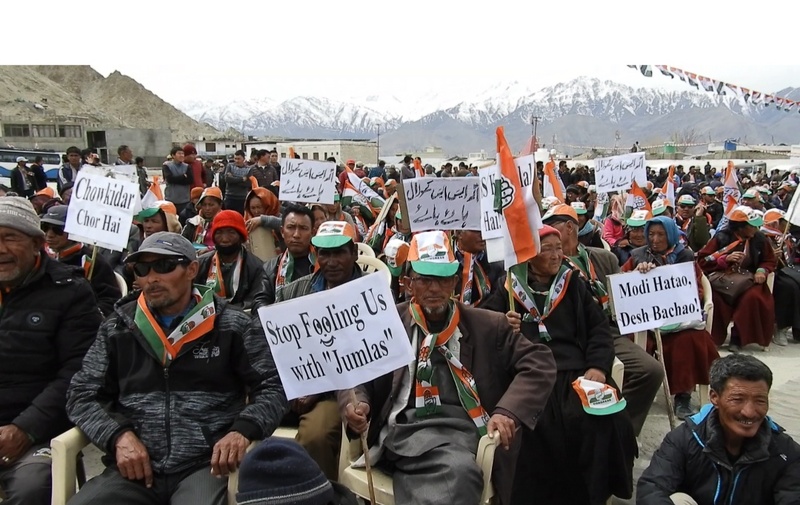 LEH: District Congress Committee, Leh organised a mega public rally on April 16 at Pologround Leh. Nawang Rigzin Jora, Former MLA addressing the public gathering slammed BJP government for not meeting the expectations of the people. He said, “The government has terribly failed in keeping up their promises. The major developmental projects carried out in the region are actually initiated by the Congress party and today BJP is taking the credit unnecessarily”. Appraising the MP candidate Rigzin Spalbar for the upcoming Lok Sabha election, Jora said that he is a well experienced and committed leader whose contribution for the development of the region is well known. He said that Rigzin Spalbar has proved his caliber by serving the people for many years at different capacities. While addressing the gathering, Rigzen Spalbar said, “I feel honoured to have received the mandate for such rare opportunity is the result of my tireless service to the people for many years”. “It is high time that we should think of Ladakh as a whole rather than playing narrow and dividing politics in the name of Leh and Kargil”, he said. He further assured that given a chance, I shall work for the development of region as a whole. Deldan Namgail,Former MLA Nubra, Gurmet Dorjay, Councillor Korzok,Tsering Samphel, Former President DCC, Leh and other senior leaders also spoke on the occasion.